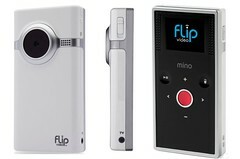 I’ve been using the tiny Flip Video MinoHD (by Pure Digital Technologies) for about a month now. I’ve had a chance to try it in a fieldwork setting (elder interviews) and while traveling on vacation. While I have never had that much interest in doing video (professionally or personally), the MinoHD is lots of fun, easy to use and (obviously) extremely portable. In sum, this camcorder is probably best for short subjects, such as talking briefly with someone standing at a particular location where video images would add to the recording keeping. I intend, for example, to use the camcorder while standing outside with an elder who is telling a story about the location in which we are standing. It is ideal for scenery. It is not great for longer interviews largely because of the need to download the video file after one hour. As someone who would never have considered carrying a video camera with me while doing fieldwork, I will carry this one because of its size, ease of use and convenience. This was written by Tad McIlwraith. Posted on Wednesday, May 13, 2009, at 4:46 am. Filed under Methods. Bookmark the permalink. Follow comments here with the RSS feed. Both comments and trackbacks are currently closed.